At the stairs, the first three vertical balusters, at the landing, the holes into the hickory were drilled slightly oversized, leaving a gap of nearly 1/8 inch around each baluster. It looks unfinished. I’m going to suggest building some sort of collar at the base of each metal baluster to cover the oversized holes if the wood cannot be properly closed up. The roof at Jadin’s tall window is still not modified to permit full operation of window. Ron had worked out plan with Brett. Ron was going to get this done during framing of garage, using that crew, but the crew change delayed this. Then Ron got sick. 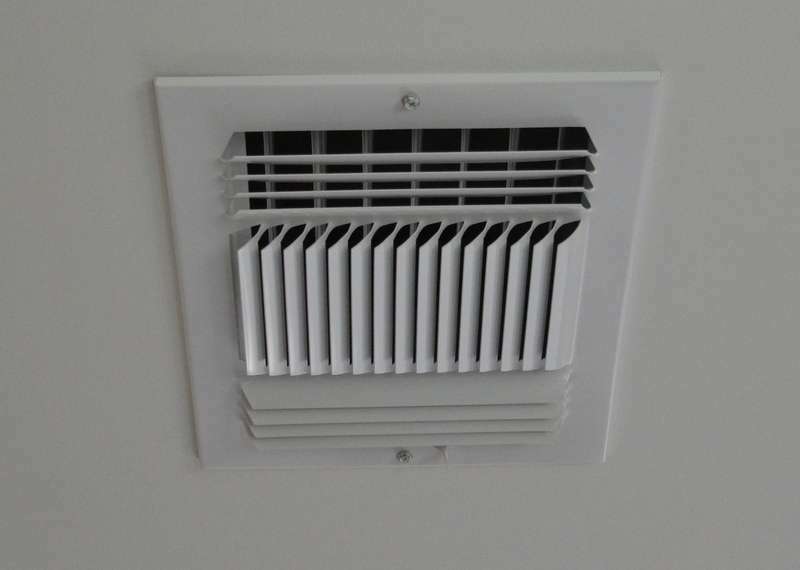 Can we get this done before the heat wave strikes Austin and I have to turn on the AC that will leak outside when the roof is cut open? I’m working in the garage, trying to put away boxes, trying to clean it up. As I moved piles of lumber today, I started to vacuum up the debris left behind when the electricians drilled the lumber for conduit in the new garage bay. And I discovered that at least five of the nuts on the bolts that hold the base plates to the foundation are loose, not properly tightened down. I do not have complete access to all the bolts, yet, because I have not worked my way through all the lumber piles. I’m going to need help moving objects away from the walls in order to check each bolt/nut. There are several more loose nuts on the bolts that are supposed to anchor the base plates of the new garage to the foundation. I can spin at least ten with my fingers, easily. In fact, there are no lock washers on anything I’ve checked. I have collected a number of items that belong to Ranserve – various tools, a code book, adhesive tubes, concrete mix, etc. While putting together Jadin’s closet, I tried to use the closet lights, which are plugged into outlets in the ceiling of each closet. There is no power to the outlets. I plugged the same lights into an extension cord which was in turn plugged into a wall outlet, and the closet lights worked just fine. I have not been able to check other closet lighting yet. Let’s please ask the electricians to check/test each closet outlet; I have not had a chance to check each closet light. Upstairs bath in hall – the hot/cold valve is reversed. 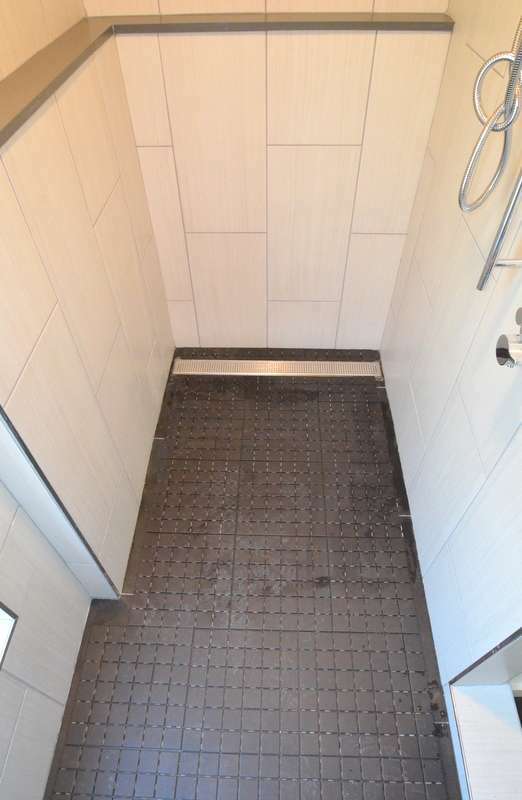 Master bath – the wand shower head – the hot/cold valve is reversed. And, there is very little water pressure. And there appears to be no hot water. Pot filler – 1. It’s not level – which is driving Jacquela nuts – and 2. I wonder if it is possible to pull off the handle at the end that faces the user and reverse it. It currently points down, which means the handle end sticks into whatever pot you are filling and your hand is in the water; if it pointed up, your hand would be out of the pot and moving in air, not water. I’d like to ask for an intervention on the drain pan under the upstairs tankless. Barry has now been here twice. 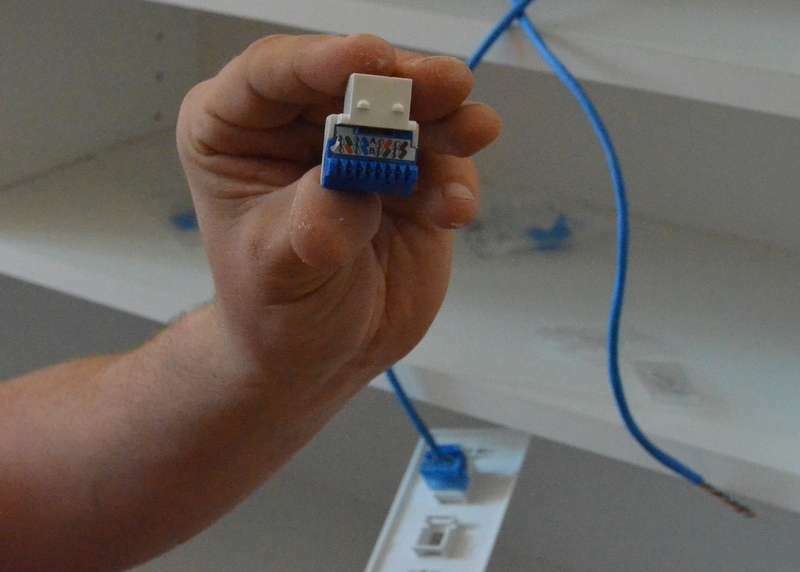 As of now, the blue pex line that drains the tank is cut about 12 inches below the tank and connected to a more flexible clear tube that Barry shoved into the white PVC that travels through the wall. 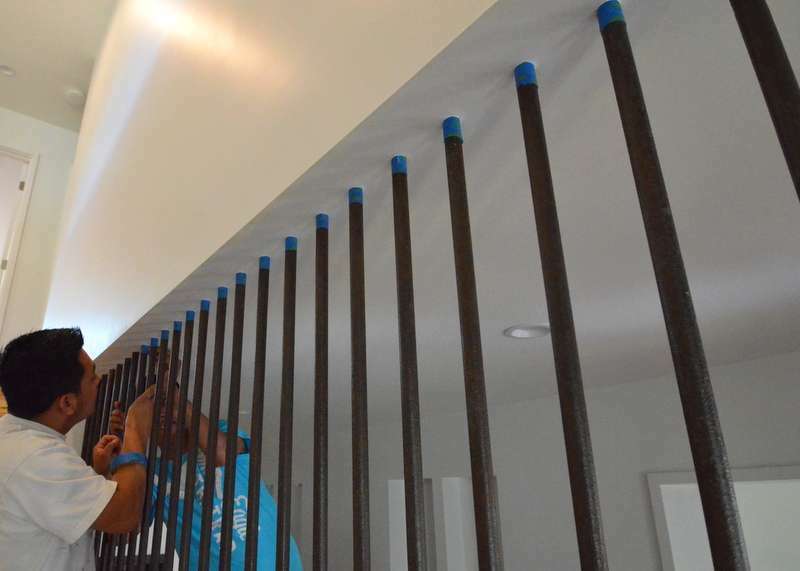 The blue pex and clear tubing do not travel around the elbow inside the wall, so water backs up and into the pan. We need something that makes it down past the elbows in the wall. That’s number one. We need one continuous line of tubing/pipe from the bottom of the tankless into the PVC, my opinion, instead of something that looks like a repair and is invented in the field. We are now seeing water pooling in the drain pan under the downstairs tankless unit. Smartest thing we did was to comply with city demand that we install the drain pans. But … why are they both leaking? Solve that riddle and we deal with the problem, instead of patching the symptom. Low voltage. Total of three waterbugs not yet installed at both tankless water heaters and the washing machine. Low voltage. Glass break not installed in office. Window crank handles. We are missing at least one – in the master bedroom. May I request a lesson in how to properly align the handles? 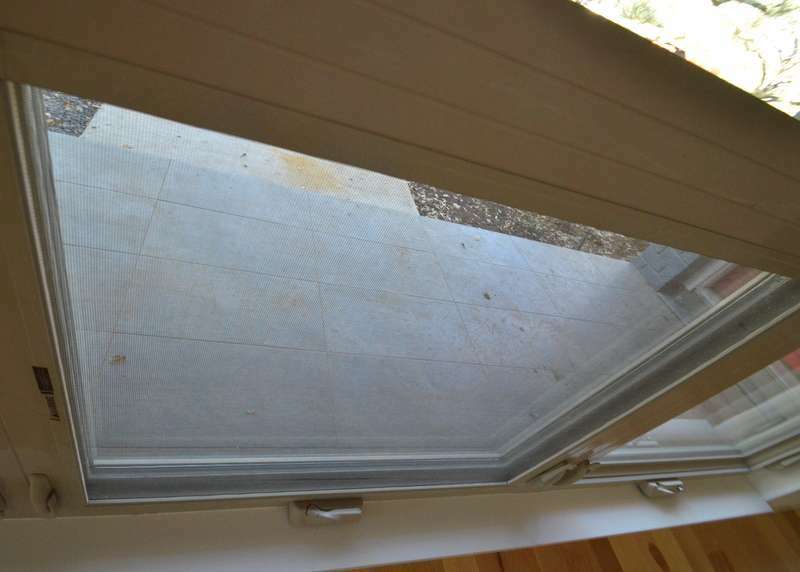 After opening the window, then closing the window, the handles do not properly align with and settle into the mount. Everything is off by a couple of degrees. And … there are several caps over the window locks that are scratched or worn, even on windows where we have no shades/blinds. Wifi access to HVAC control system. I paid for this. I’ve asked Austin Air for the software and other tools that might be required. No response on this item – though to give Chris and team all credit, they have responded to other questions I have asked. There is a chip in the “globe” on the frosted glass of the light under the ceiling fan in the family room. I reported this to Ron months back, when the fan was first installed. I kept tagging it with blue tape. The blue tape kept disappearing. 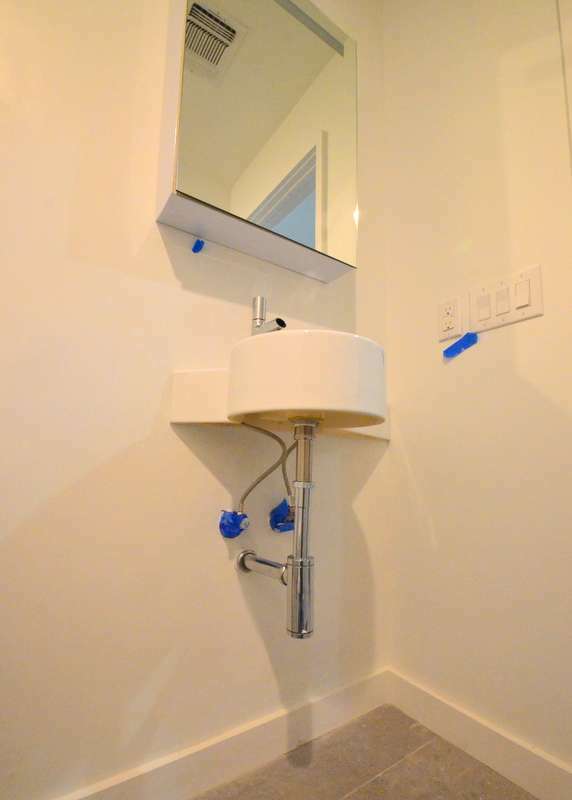 In the master bath, the grey quartz used for the shelf behind and above the vanity sinks is scratched. Is Austin Stone able to buff this out, or polish it away? Spackle and paint holes in office ceiling; also check for blue-tape around house to indicate paint touchups. Address Kitchen cabinets – several drawers do not work properly. Façade pieces below oven and microwave that need to be re-glued. 21-23 require a visit by Aaron. Perhaps several. There are two drawers next to sink that do not close properly – one for garbage cans and one for utility knives. We reported this before moving in. Also, at the utility knives drawer, the four inserted metal bins – the wood does not fit into the insert correctly – the unit needs to be redone/refitted. Chris in Aaron’s office suggested they should replace the side slides with undermounts to help fix operation of these two units. There are several wall switches where the sequence of which switch works which light should be optimized. For example, there are two on/off switches in the master hall outside the closet. The switch furthest from the closet turns on/off the ceiling lights in the closet. I’m still not sure what the second switch does. But … that second switch is closer to the closet and should be the switch that operates the closet ceiling lights. I have a question about the mudroom ceiling light. 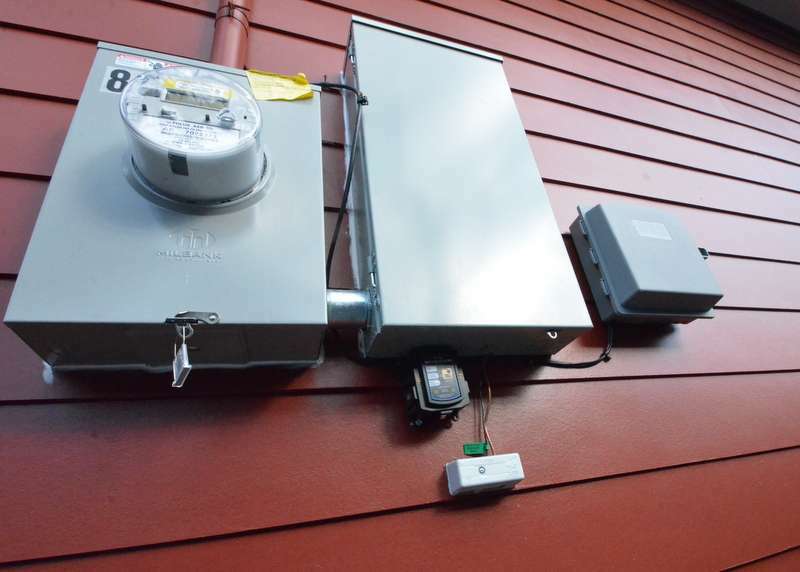 The switch that operates the light is located near the garage door. Is it possible to add a second switch on the kitchen size of the mudroom? As it stands, we have to walk through the dark mudroom to turn on the light. I have a question about the two ceiling lights over the dining room table. We aligned and installed them on a north south axis. We have discovered with the table in the room that the table works best on an east west axis. What might it cost to pivot the lights and then patch and paint the ceiling? The screen at the front door window – the paint is chipped and bare metal is exposed. This problem repeats at screen to side window in loft. Putting the house numbers on the front exterior wall of house. Ron was going to have Cris do this. Pocket door to master closet – it binds and grinds if you try to close the door past the halfway point. Electrical – master bedroom. If the ceiling fan is running, and you turn it off at the swtich on the wall, the ceiling lights at the hall flash on for a split second and then go off. Jacquela believes she has seen the same behavior with the ceiling lights inside the closet. Is a wire crossed? Is there a short? Door to master suite from upstairs hallway. 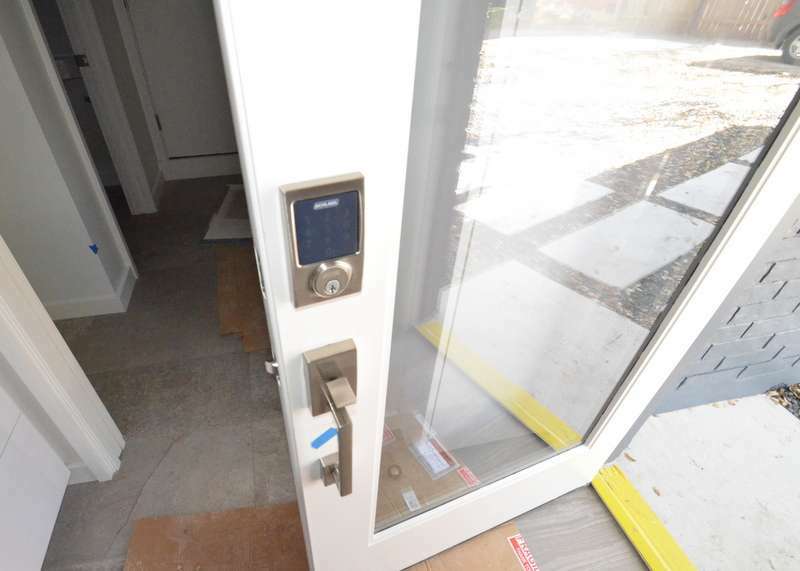 One of the pocket door handles is missing – on the interior side, not the hallway side. 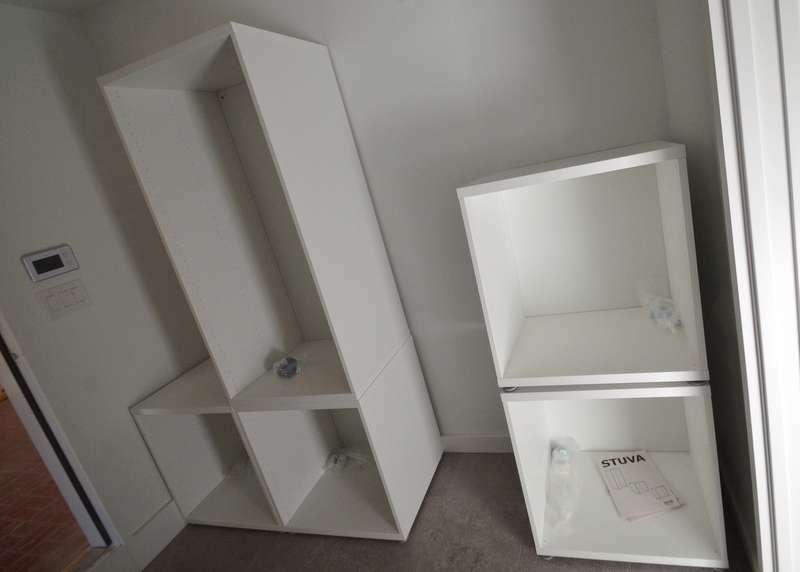 Electricians installed in several closets Ikea lights that operate on/off/motion sensor. The motion sensor does not operate. Is this a fault in the light? Or, is it a fault in the wiring? In kitchen, at sink, both sink drains are misaligned/not centered. At mudroom, there are three hinges on the door to the garage. Two are one type of hinge. One is a second type of hinge. Why the mismatch? Kitchen door to mudroom, wall next to broom closet on kitchen side is unfinished. Light switches at kitchen next to side door – reorder sequence of which switch operates which light – marked with blue tape. 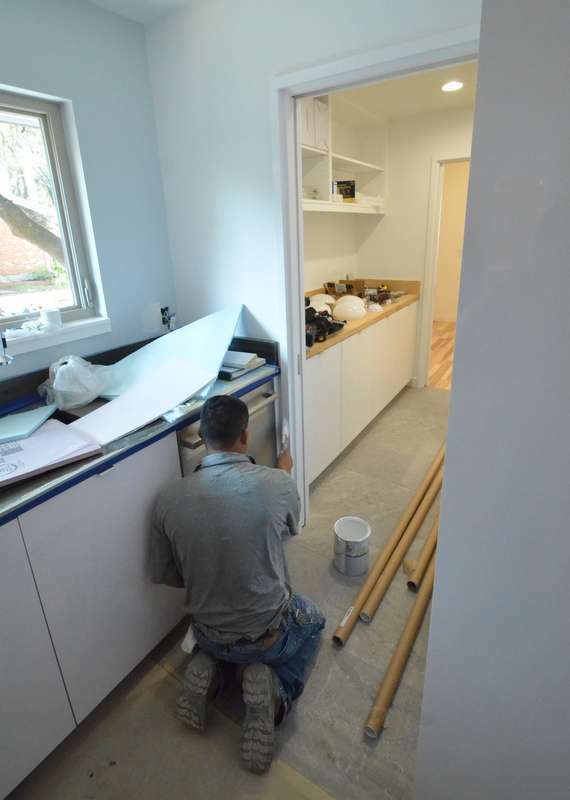 Pocket door from kitchen to butler’s pantry – pocket door hardware hits door jam and is scratching. 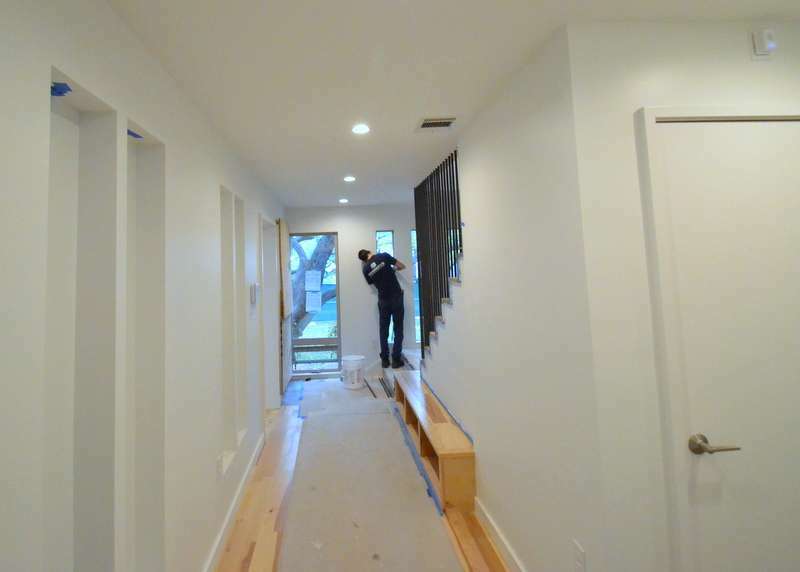 Drywall above several doors, upstairs and down, is not finished. 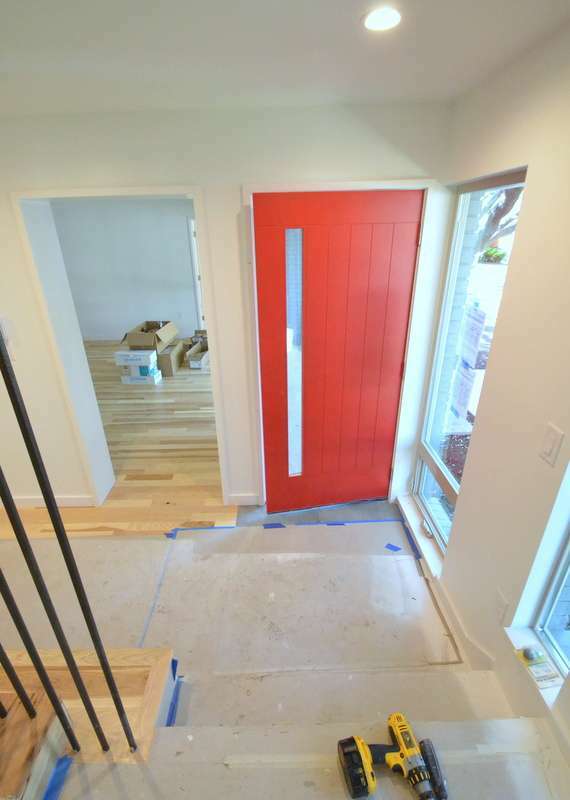 There are gaps between drywall and door trim/frame. Marked with blue tape. 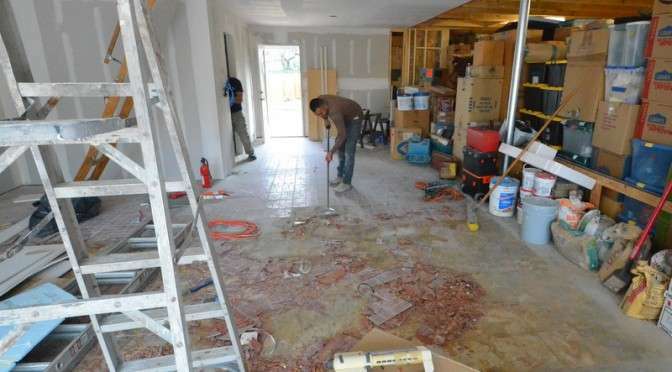 Acid wash of garage floor after removing tile was never done – to remove traces of glue. 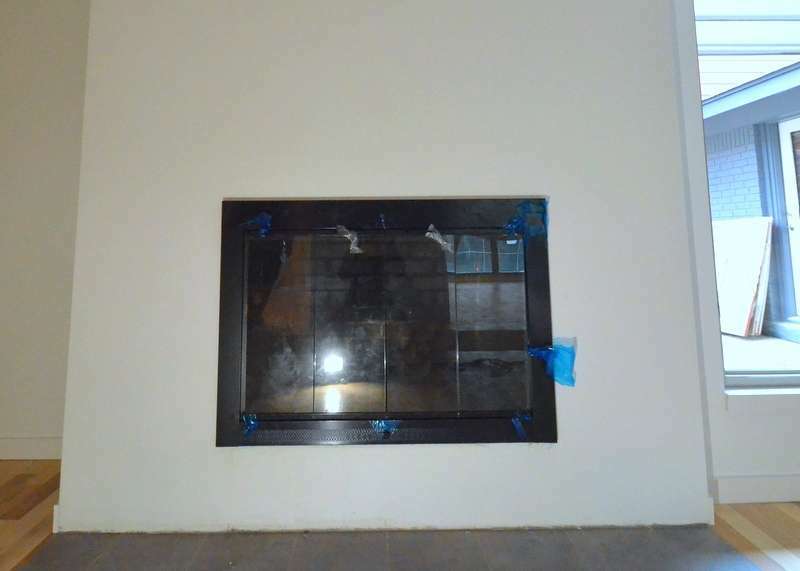 Finish metal baseboard under fireplace. 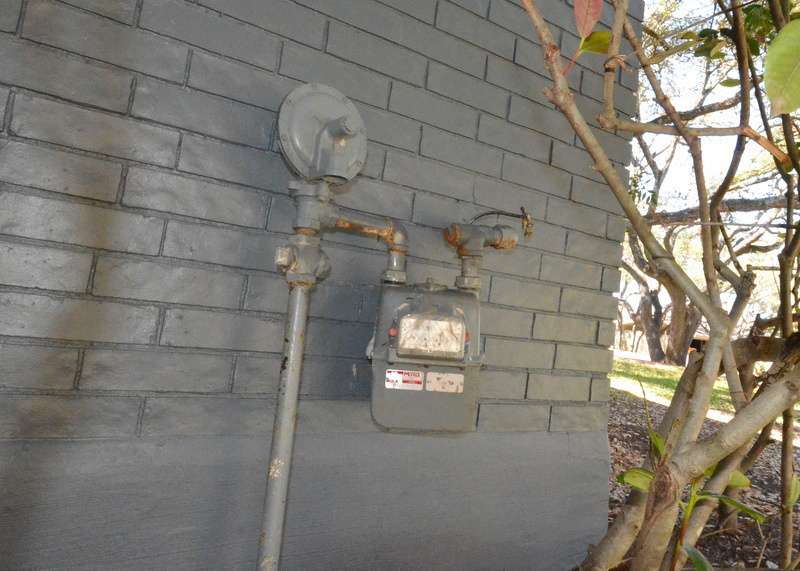 Missing fireplace gas key – and install pipe extension inside fireplace that is lying loose. 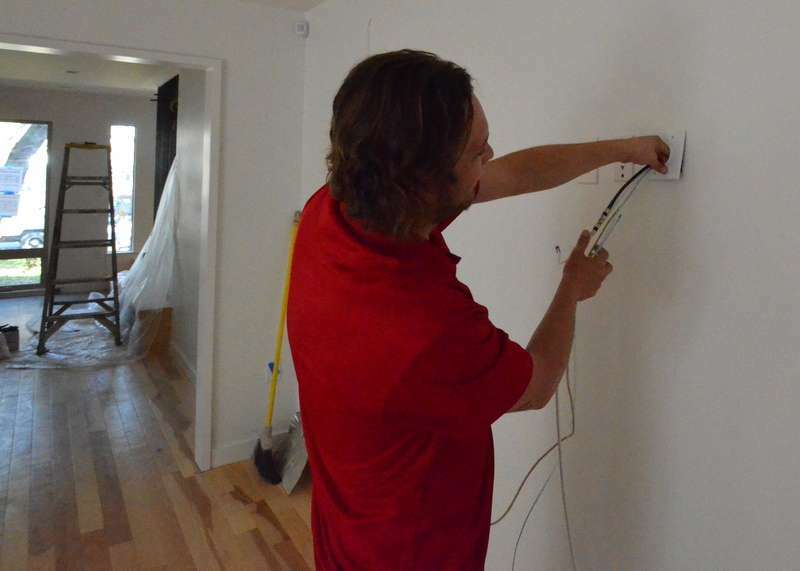 Family room, speaker wires extruding from wall – these need faceplates. Entry hall – puck lights in four niches are not fitting tightly. 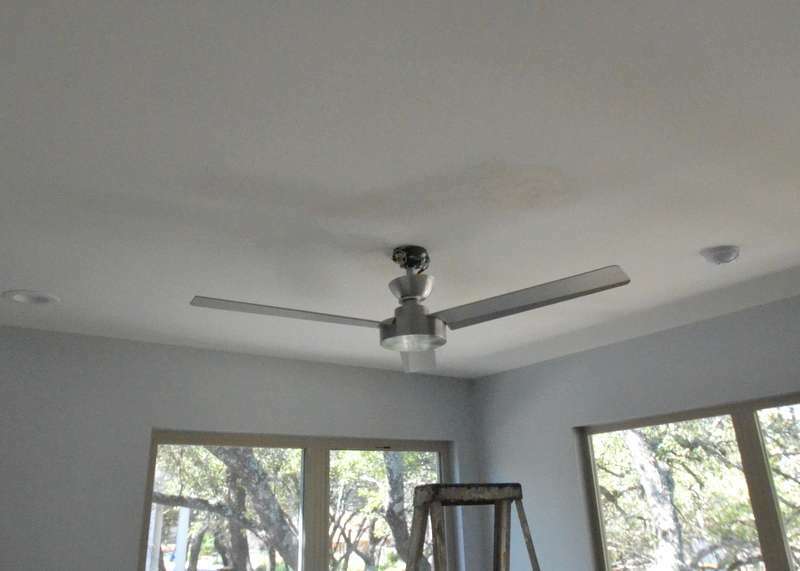 Loft – finish ceiling smooth around ceiling fan, clean paint off ceiling fan where it mounts to ceiling. 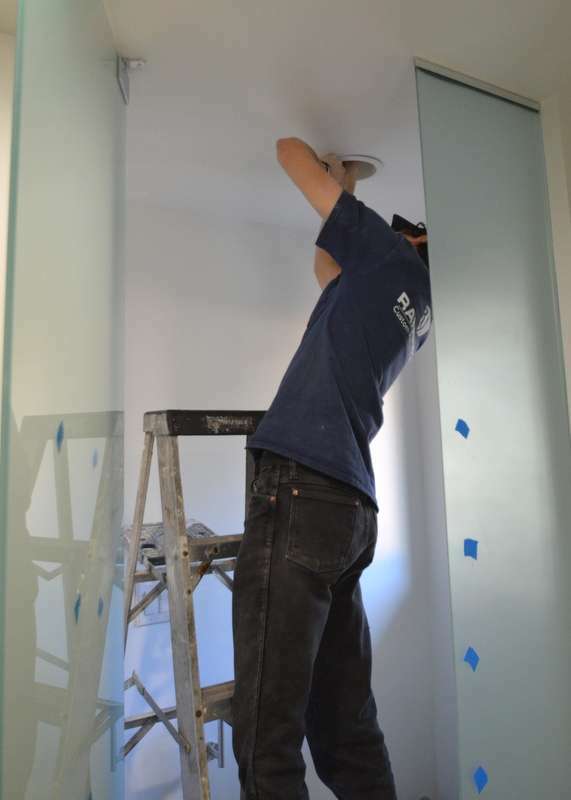 There are temporary lights in bedrooms 3 and 4 that Ranserve installed to pass inspection. These need to be removed and returned to Ranserve. There are several boxes for these in the mudroom. Bath 3 upstairs – needs silicon around tub filler spout. 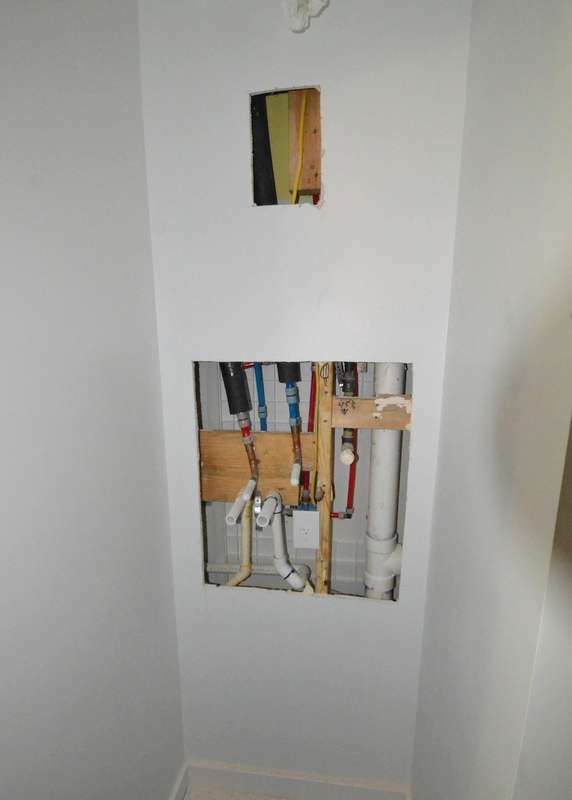 Master bath and water closet – reorder which switch works light and which switch works exhaust fan. More important, both switches inside the water closet sometimes turn on one medicine cabinet, sometimes both, sometimes the other. Is this a crossed wire? 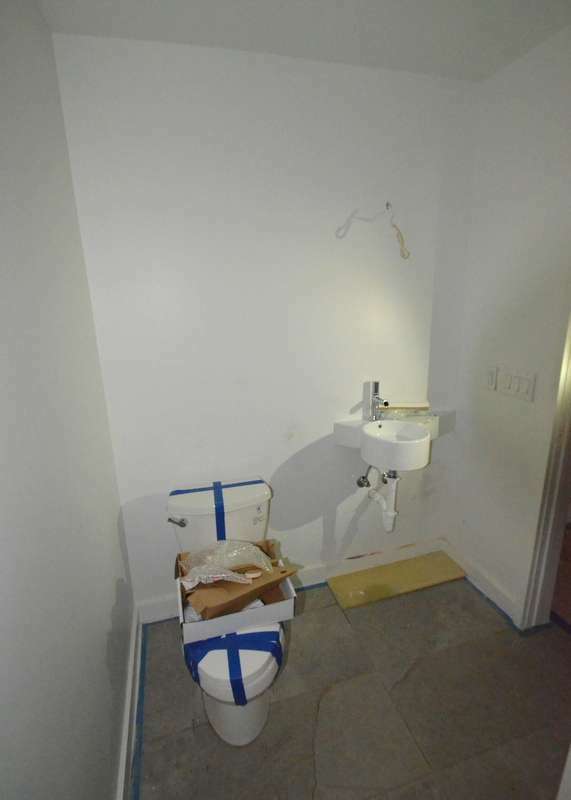 The WC switches should operate ONLY fixtures in the WC, not the medicine cabinets. 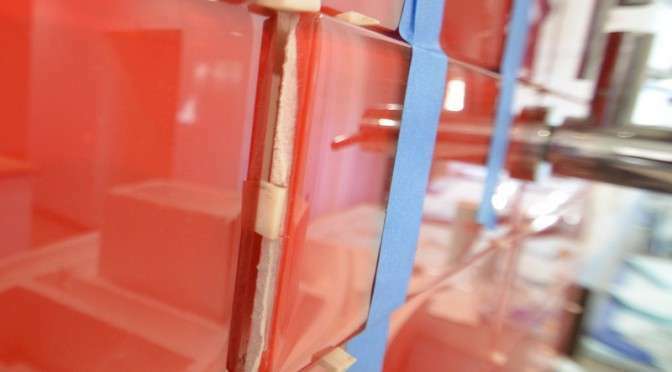 Paint and drywall – address all issues at blue tape as marked throughout house. 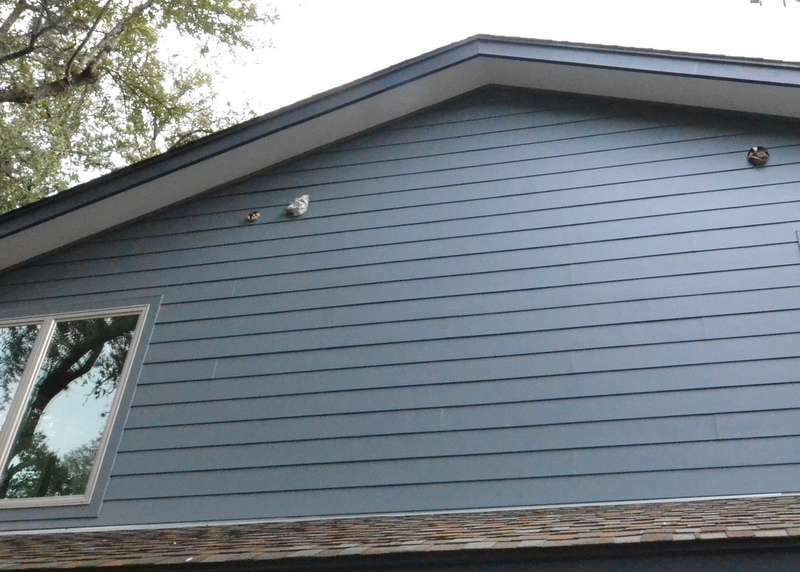 There is a tall extension ladder in the back yard behind the garage that we believe belongs to the painters. Resolving the bill from Custom Plumbing to clear the main drain of the house. 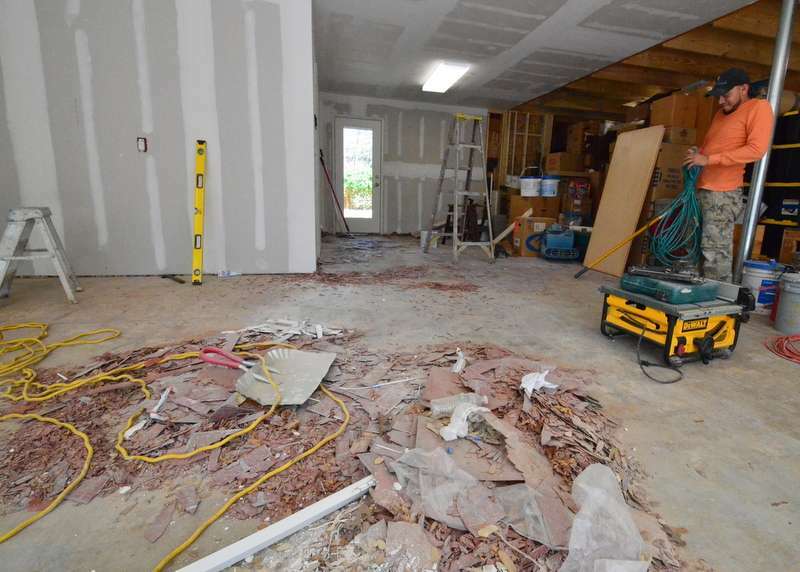 Finish the drywall and trim at the mudroom and back door in the garage? Ron Dahlke is officially placed on medical leave by Ranserve. More details to come. Above, meet Odell Grant from Ranserve, stepping in to serve as site supervisor as we push to complete the house and move in. Odell is wondering why that hand-made aluminum pan, roughly and not well built, was installed as a drip pan under the tankless water heater, suspended from the copper piping by thin rusted wire. Steven and Jacquela do not approve of this attempt to meet City of Austin codes that require the drip pans. Steven today ordered two replacements from Amazon — one for upstairs, one for down. 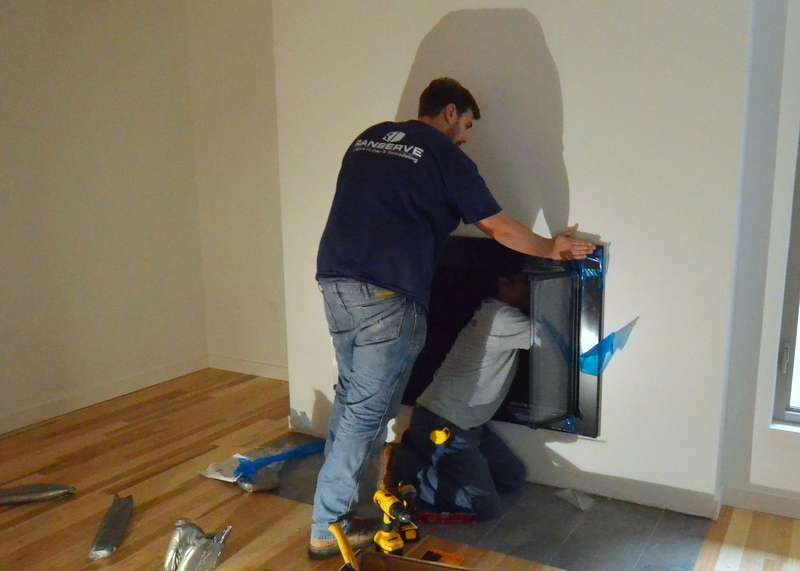 Austin Air yesterday completed the startup of the HVAC system. We have heat and air conditioning at Emerald Hill for the first time. The gas furnace is powered up. The condensor could make cold air if we asked it. 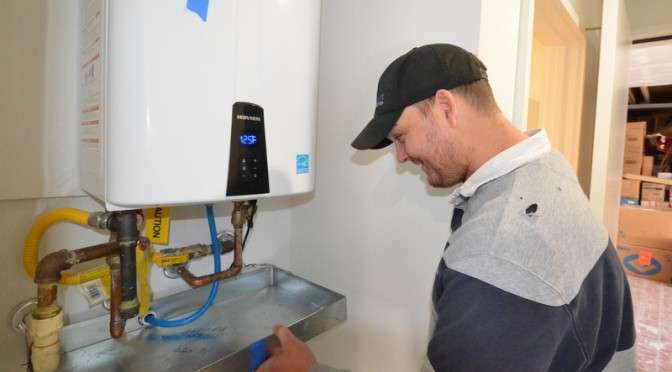 The gas meter is hooked up, which is why the furnace and tankless units are able to generate heat and hot water, respectively. But … there is a distinct smell of escaping gas when Steven took this photo. Odell immediately called the plumbers. Odell and Steven walked and talked Emerald Hill for about two hours, building a punch list for Odell to work through. He’s helicoptered in to pick up where Ron left off. Deep breath. About 145 pm Odell reported that the tempered glass needed for the tall window at Jadin’s bedroom will not arrive until Tuesday next week, 1 March. 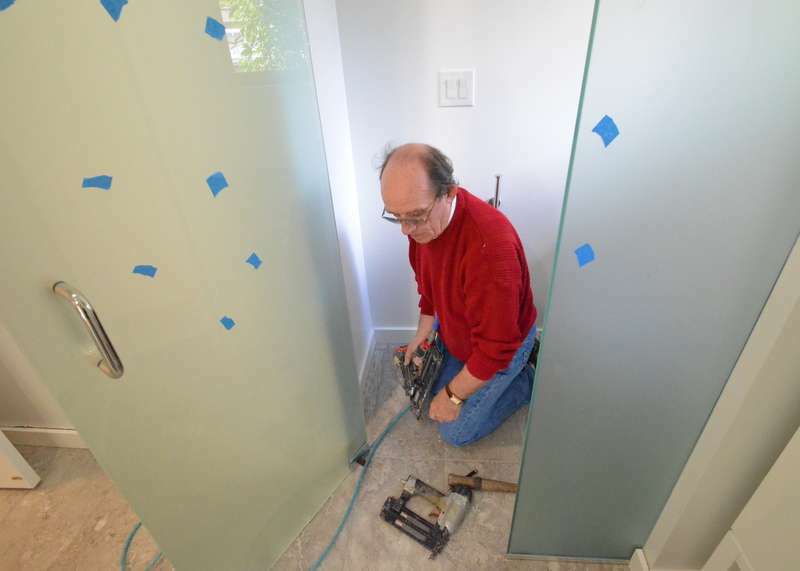 The inspector requires we replace the conventional glass with tempered because a closet door opens toward the window. Safety. As a result, Odell advises that we push back the move-in date, which was scheduled for Wednesday, 2 March. Steven called Rene de Anda at El Sol Logistics, the moving company. The move is now scheduled for Friday, 11 March. Cris from Ranserve is working all over the house as Odell and Steven walk and talk. Here, in the master bedroom, Cris is patching the ceiling where we shifted the fan to center of the bed, instead of in the center of the room. Steven ordered Internet, TV and phone services from Time Warner; installation is scheduled for Friday, 26 February. Steven is back from Barcelona and ShowStoppers @ Mobile World Congress. Mark Rehberg from Ranserve and Steven spoke by phone, email and text several times today. Mark is bringing in Odell to serve as site supervisor while Ron takes medical leave. At Mark’s request, Steven began assembling a punch list of pending items to help bring Odell up to speed. Steven compiled items from memory, then walked the house to compile line-item details for Mark and Odell. Mark reports we are working toward a final inspection for next week. 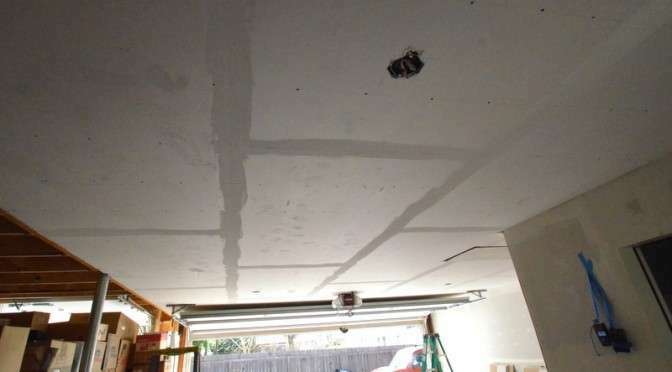 Above, the ceiling of the garage is now drywalled, as required by the inspector. 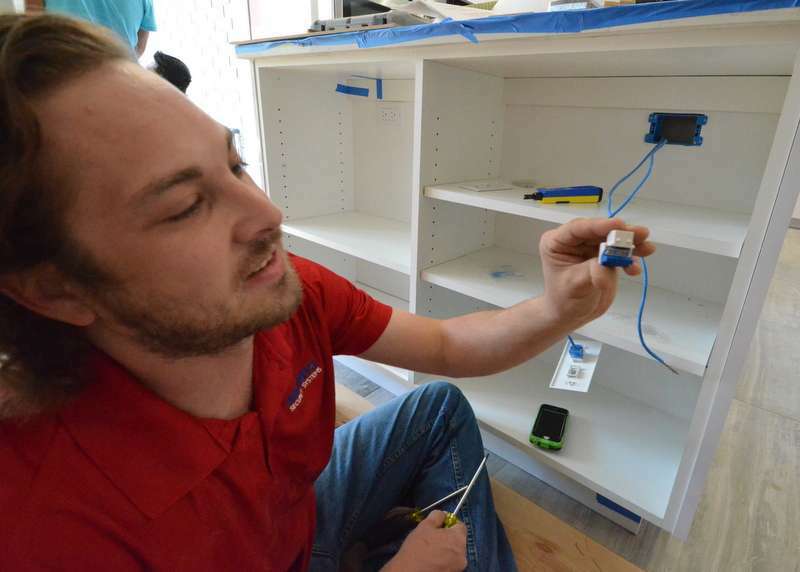 Steven is also coordinating the installation of whole-house surge suppressors by the electricians, and coordinating installation of TV, phone and Internet services by Time Warner. 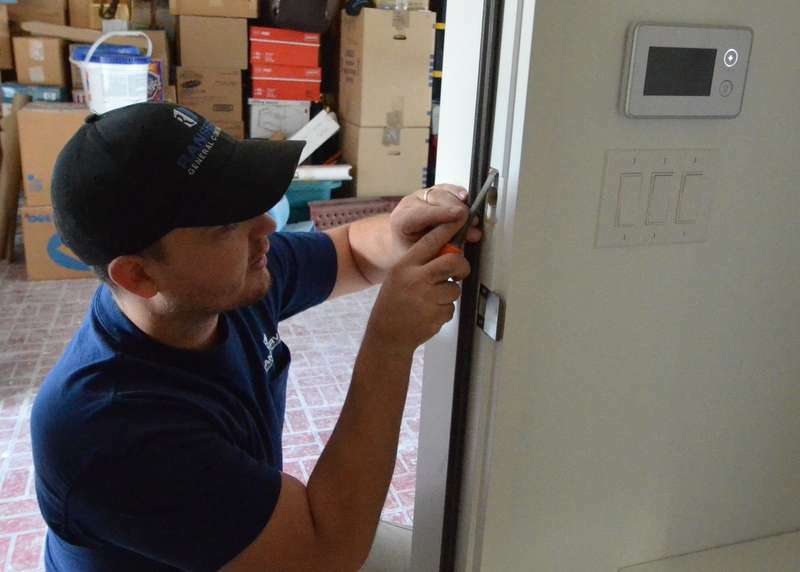 While Steven was traveling, Peter and Shane worked with Jacquela to shift the Schlage electronic lock and deadbolt to the side door off the kitchen — the most-heavily used exterior door to the house. 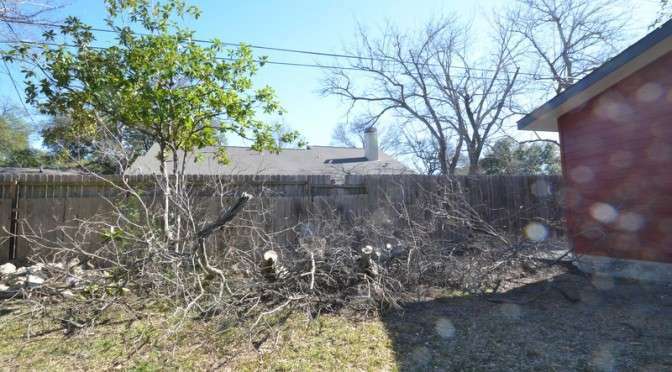 Steven arrived at Emerald Hill about 230 pm to learn that the City of Austin chopped down a tree in the neighbor’s yard to clear obstructions from the power lines. 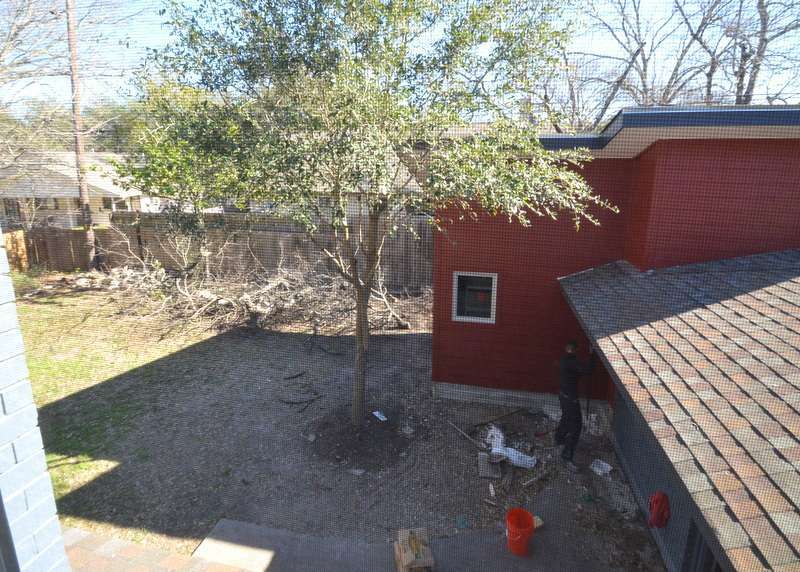 The company hired to do the job — Asplundah — left the branches behind in Steven’s back yard, photo above. Ron Dahlke says Asplundah will be back Thursday. Asplundah has been working all over Northwest Hills, clearing trees from power lines up and down nearly every block. 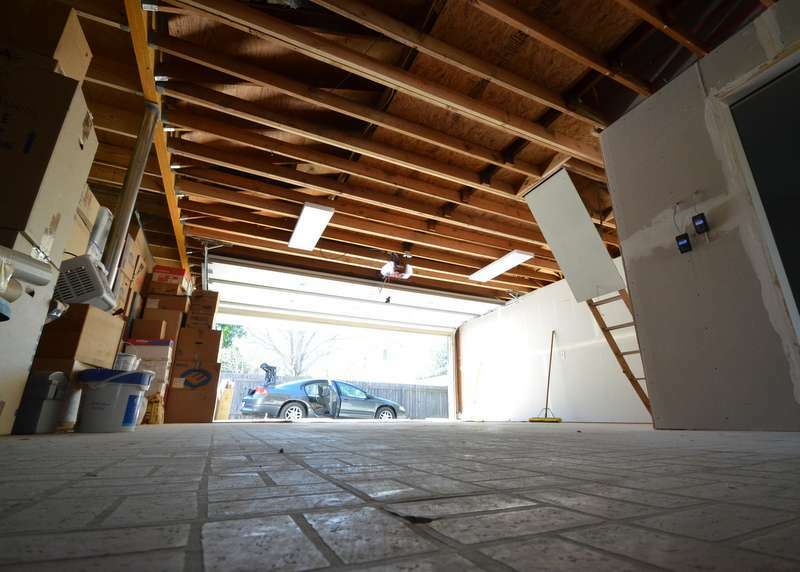 Ron Dahlke and team cleared the original two-car garage of his desk, a tool box, and more. This is what might be described as a bittersweet milestone — Ron is preparing to move out of Emerald Hill and the remodel is coming to an end. It is, also, a mile marker for how close we are to done — and moving in. Team Ranserve installed the window screens today. Hard to see in this photo. Ron and Steven walked the house. There are six screens not yet installed that need to be delivered. Rodriguez from Gilsa Construction hacked away today at the remaining form and hardened concrete spillage left over from pouring the foundation for the new garage bay. 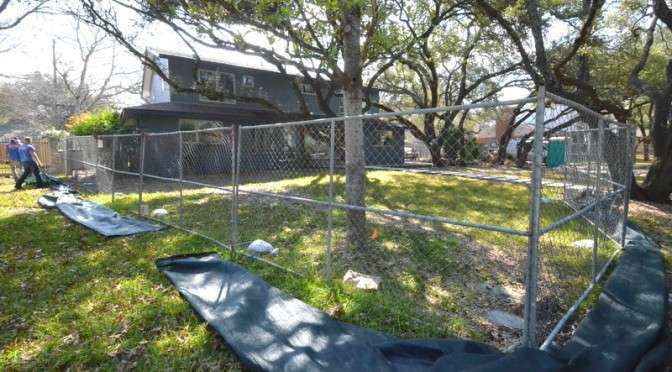 Elite Air Conditioning began swapping out the straight registers for curved — as required by the Austin Green Build program. 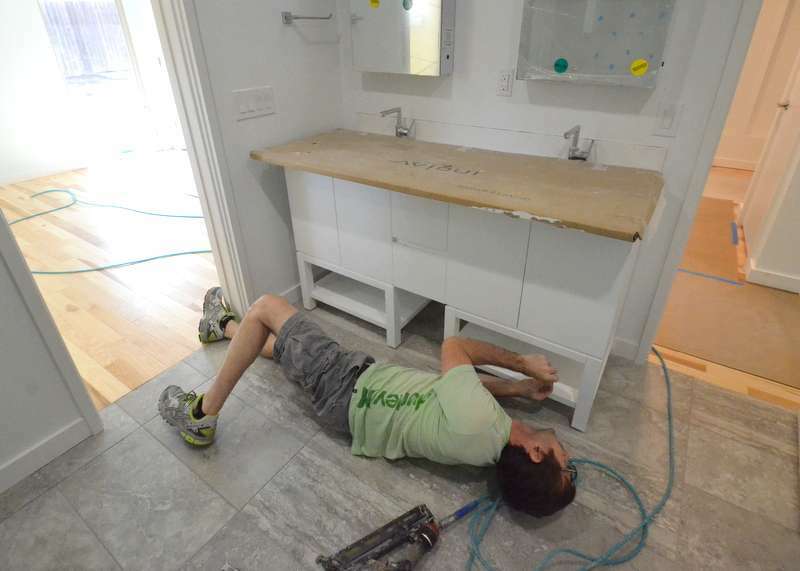 Steven began assembling and test fitting the Ikea Stuva cabinets in the mudroom — confirming that one of the baseboards will need to be trimmed for the cabinets to fit left to right. 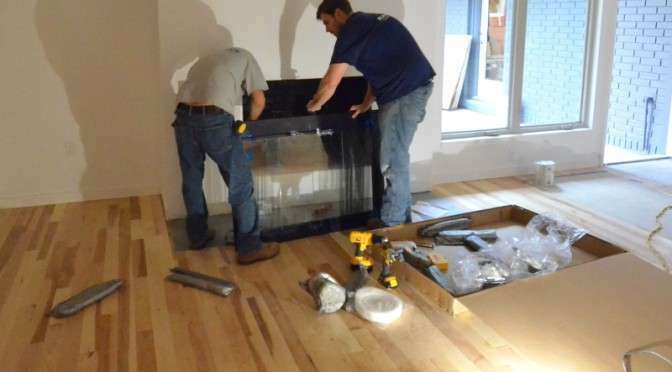 Kris and Matt from Ranserve installed the fireplace glass doors today. 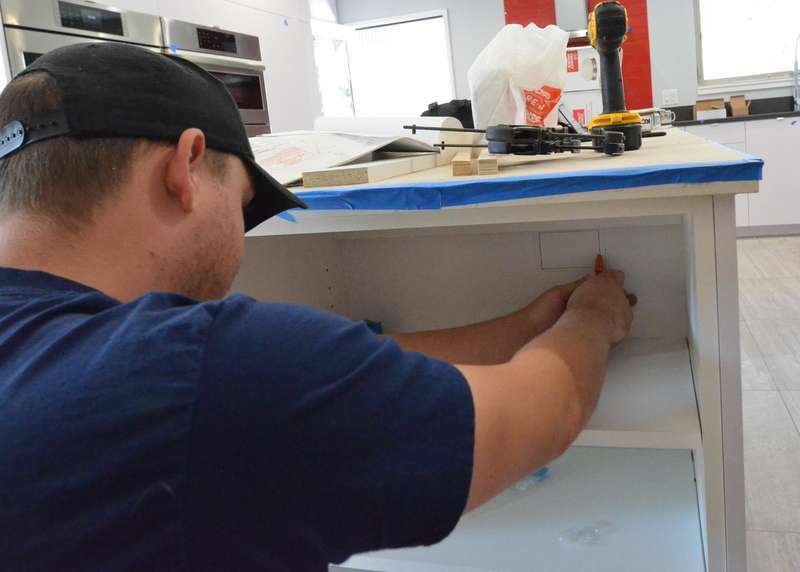 Matt keeps it level and flush to the wall while Kris screws the mounts inside. And nearly done. Kris and Matt had to adjust the alignment of the glass doors. 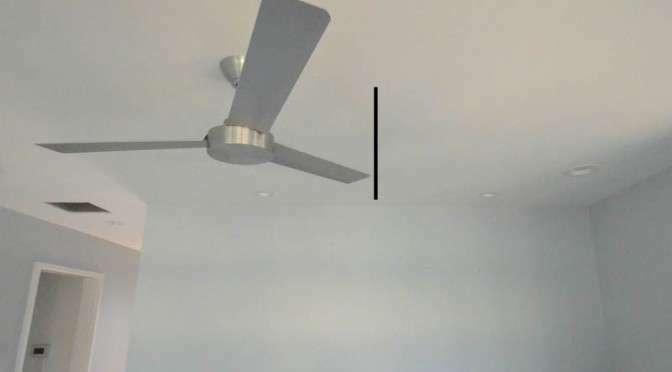 Above, the ceiling fan in the master bedroom is centered in the center of the ceiling. Duh! But … it is not centered over the bed. The black line annotating the photo locates the approximate center line between the two 4-inch can lights over the bed. Jacquela wants the ceiling fan centered over the bed. Steven will discuss with Ron. This will probably become a change order. Expensive illustration of how you just can’t catch every small detail until all the parts start to assemble into a finished room. 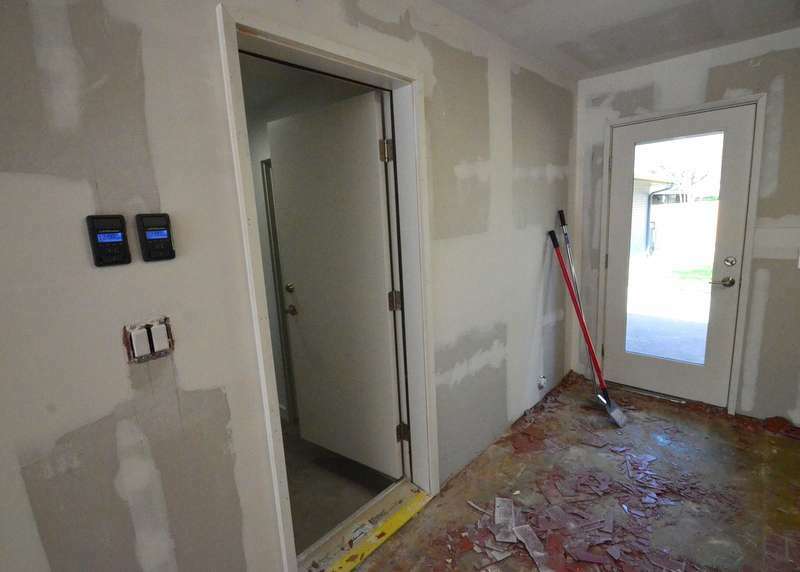 Why did the plumbers or electricians open up the drywall where the tankless water heater will mount in the mudroom? The ceiling fan in the family room is too low. There’s about one foot between the top of Jacquela’s head and the bottom of the light kit. The “problem” may be the mounting post. It looks like it’s six or eight inches tall. Steven remembers asking for a 3-inch post from Lights Fantastic. 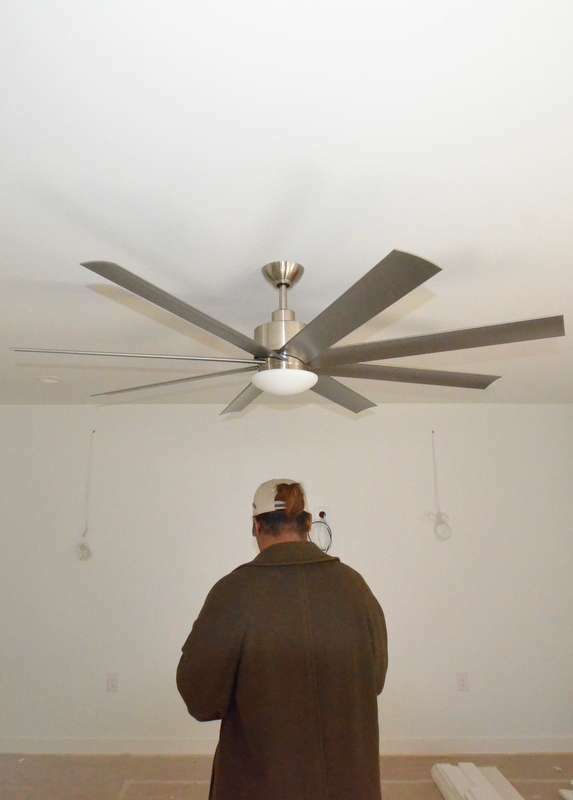 That shorter post would raise the fan closer to the ceiling — which means Mark Rehberg from Ranserve, at six-foot-something tall, won’t get a haircut if he walks under the fan while it spins. Something to discuss with Ron. 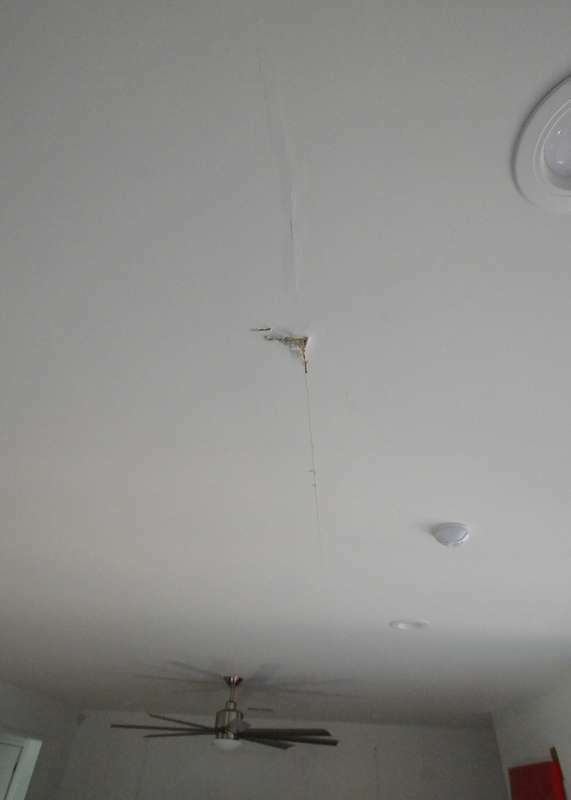 Before departing on business for a week, Steven reported to Ron that a seam was buckling in the ceiling of the family room where two sheets of drywall meet. And the buckling is traveling toward the kitchen, from where Steven shot this photo. Someone has now started to carve the sheets apart. 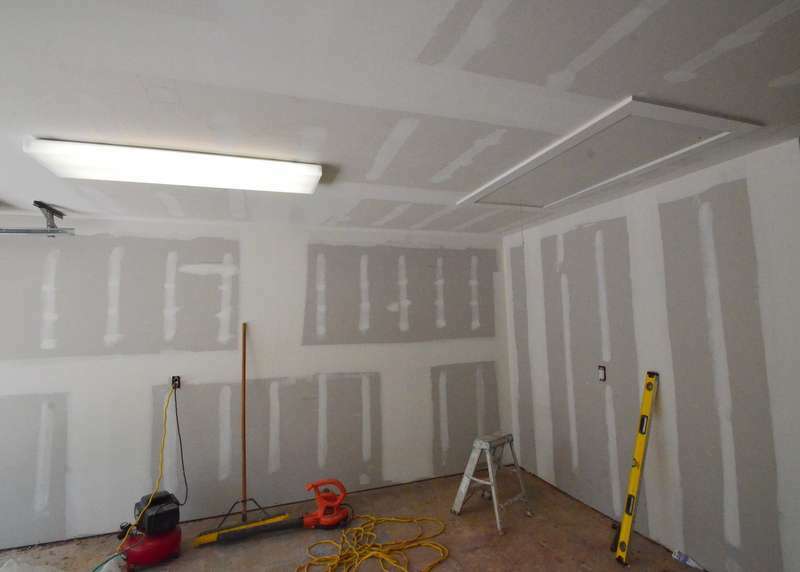 Was the drywall installed correctly? Is structure shifting in the house? Something to discuss with Ron.